A month or so ago I shared a quote from Laura Florand's Blame it on Paris for a Weekend Cooking post. That book was a memoir of her time in Paris and meeting her French husband. Now Laura Florand has moved onto writing contemporary romances that are set in Paris (which is really what I thought I was getting when I started Blame it on Paris) and that feature lots of delicious sounding treats and delectable French heroes. While I am reading a fair bit of contemporary romance at the moment, most of them are either set in big Australian or American cities or small country towns in those same countries. I can't think of many other contemporary romances that are set in other countries or places, so the fact that Florand is choosing to set her romances in Paris is a unique point of difference, and definitely a selling point for this reader. There is a novella that forms the first part of this series, which I haven't read yet, but I have read both of the full length books that followed that first entry. Today I am going to write about both of them, The Chocolate Thief and The Chocolate Kiss. Cade Corey is the closest thing to a Chocolate princess that you will ever meet. She is from the famous Corey family who have made their fortune on mass producing chocolate bars that are sold for 33 cents at places like Walmart, that filled the ration packs of American soldiers during World War II and whose name is a household brand name across the country. Of course, if you are a French artisan in chocolate, you barely think that such 'chocolate' is worthy of carrying the label of chocolate. So when the chocolate princess, who also happens to be the heir to the company and is currently an executive of the Corey company, comes to his shop offering to put his name on a new range of gourmet chocolate under the Corey name, it shouldn't be a surprise when Sylvan Marquis refuses to even consider the offer, no matter how much money Cade is offering. When none of the other chocolatiers she approaches either, Cade has to rethink her approach. While Sylvan may not be a billionaire, he is a very successful chocolatier. He is world renowned, with the rich, powerful and famous spending hundreds of dollars for small tastes of his creations, even if that means that they have to have them shipped halfway around the world. He doesn't need to put his name on the Corey chocolates, and doesn't quite get why Cade thinks it is such a good idea, especially seeing as her main selling point seems to be how much money he will make. What Cade doesn't reveal in the early encounters is that while she is in Paris for business, there are personal aspects to the visit. One reason is the possibility of spending time in Paris itself, the home of many of the best chocolatiers in the world and for the city, and the other is that she has a little crush on Sylvan! The attraction is mutual - as much as Cade might drive him crazy when it comes to understanding his passion for his hand made creations, he is also drawn to her for herself. When there are a series of breakins to his shop but nothing is stolen, it doesn't take long for Sylvan to realise that it is Cade who is trying to steal his secrets and it fast becomes a secret game between the two of them. However, when an influential food blogger finds about the secret, it is he who labels the thief as The Chocolate Thief. I really enjoyed how much chocolate in it's many forms filled the pages of this book. Whether it be the most simple mug of chocolat chaud (hot chocolate) to the most intricate of designs that Sylvan comes up with to tempt his customers and Cade, you will be left craving just a taste of some exotic chocolate. Or if you don't have any of that..a block of Cadbury chocolate (which I what I equated the Corey brand with). While I don't think I necessarily connected all that well with Cade, I did appreciate the way that she was written. She is a successful businesswoman who is trying to take her company in a new direction and who must fight against the more staid stakeholders, like her father. Her grandfather understood her need for time in Paris and for her desire to discover the secrets of Sylvan's chocolate, but as far as her father was concerned her work in Paris was done, and it was time to move onto the next project, which would take her away from Paris and Sylvan. Cade in many ways was trying to find what her future could be, walking the line between the family she loved, the business that she also loved and the passion that she had for fine chocolate, Paris and Sylvan. Florand did a great job of portraying the fact that in many of the big decisions that we have to make in life, it is often not very clear cut and there are compromises to be made in order to make things work for us. Sylvan was just as dreamy as you might imagine a French hero would be, even more so considering that he knew a thing or two about chocolate and what it could do to a woman! He was seemingly strangely shy around women, which was at odds with his confidence in his work and his appearance. The reasons for this were hinted at, but I felt that there could have been a little more time spent on this particular aspect of his past. While I am talking about the major characters in this book, it would be remiss of my not to mention the city of Paris. The city comes alive in this book, some of the more obvious tourist destinations but also the hidden Paris, normally known only to those who live there. As I mentioned above there is a novella that forms the first part of this series, but this is the first full length novel and, for me, it was a fun and tasty way of being introduced to the series. It definitely left me wanting more. Luckily, the second book was already available so I quickly requested it from Netgalley. Magalie Chaudron lives and works on one of the small islands in the Seine in the heart of Paris. She lives on the top floor of an apartment building, her two aunts sharing another floor of the building and together they work at La Maison des Sorcieres. This is a small tea house which would almost epitomise my definition of whimsical. Their window is always filled with a seasonal chocolate display featuring chocolate witches and famous tales, there is a delightful collection of hats and lots of mini treats. The thing that keeps the customers coming back though is the chocolat chaud which is made from the finest ingredients but also includes special wishes stirred right in. When Magalie hears that the famous Philippe Lyonnais is opening a new shop in his franchise of pastry shops on their quiet island she is worried about the future of their little store. After all, how can they compete against his creations. Philippe is pretty much instantly charmed by Magalie, but for her it is more of an antagonistic relationship. She feels something towards him, but she is determined that she is not going to be the zebra to his lion. When he offers her just a taste of one of his fabulous creations, she refuses and continues to refuse no matter how ornate, how personal, how gorgeous the creation is that he offers just her. And while she refuses to try his pastry creations, there is no way that he is going to try any of her chocolat chaud, no matter how much it calls to him. This antagonistic attitude between Philippe and Magalie continued for quite some time (probably too long in my opinion) but I did really like them as a couple once they got it together. When I started reading this book I was very excited. The idea of the wishes being stirred into the hot chocolate and affecting the behaviour of the customers had me thinking that maybe what I was going to get a romance version of say a Sarah Addison Allen book. A touch of magic in an otherwise normal setting (although Paris is not a normal contemporary romance setting). Unfortunately, for me though, this seemed to be really overdone in the book and so I went from very excited to not so excited to a bit over it by the end. Magalie had some issues about her sense of place and belonging and this was nicely balanced with Philippe's sense of belonging to Paris and his own sense of his worth. I liked the way that the author worked in some cameos from Sylvan from the previous book, but I didn't think that the inclusion of Cade worked as well. Once again, the author made me hungry as I read the descriptions of the macaroons and the pastries and oh my goodness all of the food. I also really loved the description of life on the island that is within the heart of Paris but also had a completely separated feel to the city, a kind of remoteness that sounded idyllic. It also provided a cocoon of safety around Magalie that worked very well with her issues. If I was to summarise my reaction to this book it would be that I liked a lot of the ideas but the execution didn't work for me as well as I would have hoped. A lot of the time it felt as though it was trying just a fraction too hard.. I still enjoyed Florand's writing and characters, and the use of Paris as a setting so I hope that continues in the future books in the series. 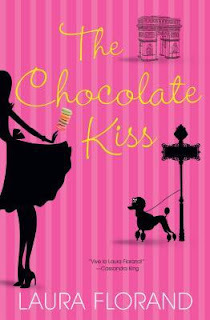 *I bought my copy of The Chocolate Thief and received a copy of The Chocolate Kiss from Netgalley for an honest review. 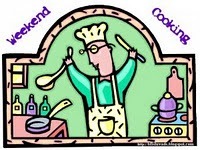 I'd like to take this opportunity to wish all my fellow Weekend Cooking participants a very happy New Year! Even though these aren't your top reads of the year, the premise is fun, and who can resist the chocolate and Paris connections. And now I have a need for some chocolat chaud. It's all snowy here and it sounds like the perfect treat. I haven't actually been to Paris but I find myself a bit obsessed with it. I love the idea of it so reading about it suits me just fine for now. I'm thinking that both of these books sound like something that would definitely fortify my obsession with the city of lights. We've just planned a trip to Paris for late May. Now I want to read these books! I would love to visit Paris but doubt I'll have the chance any time soon. A dreamy hero is so important to a good romance, but I guess French men have that down pat, right? I'd love to live in Paris and learn to make chocolate. 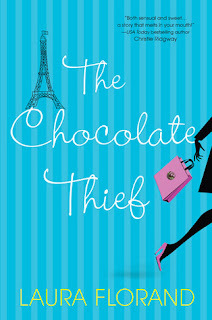 Oooh I'm reading the Chocolate Thief right now so I didn't read your review, just peeked at the grade. Glad to see a 4/5! !